Diabetic nephropathyDiabetic nephropathy is the major cause of end stage kidney disease in the U.S., and researchers in the VCKD are investigating underlying pathogenic mechanisms and novel therapeutic options. ​​The Bhave lab is studying mechanisms of normal collagn IV assembly and its dysregulation in diabetic nephropathy. They have discovered a novel role for peroxidasin to mediate collagen IV subunit assembly and are using a combination of in vivo and in vitro techniques to investigate alterations in DN. ​The Fogo lab investigates underlying mechanisms mediating progressive glomerulopathy in diabetes. They have made important discoveries about the role of PAI-1 and TGF-ß in progressive glomerulosclerosis and continue to pursue novel mechanisms of pathogenesis. In association with the Harris lab, they are utilizing the novel proteomic technique, MALDI-IMS, to identify and map protein, lipid and metabolic derangements in diabetic nephropathy. ​The Harris lab is studying the pathogenesis and treatment of diabetic nephropathy. The lab has developed mouse models of DN that more closely approximate human disease and are using these models to test potential therapeutic interventions. In addition, we are collaborating with other VCKD members in proteomic analysis of diabetic kidneys using MALDI-IMS. ​The Hudson lab has had a long standing interest in underlying mechanisms mediating matrix abnormalities in diabetic nephropathy, and in particular the role of diabetes-induced matrix modifications in the progression of the disease. As a direct result of these studies, the lab has developed a new therapeutic agent, pyridorin, that is to begin phase three clinical trials in the near future. The Pozzi lab studies the mechanisms that underlie the modulation of extracellular matrix turnover in the diabetic glomerulus in order to devise more effective therapies to prevent diabetic glomerulosclerosis. The lab studies how interactions between glomerular cells with the surrounding matrix control matrix homeostasis and participate to the initiation and progression of diabetic glomerulosclerosis. To answer these questions, the lab uses established and newly developed mouse models of diabetic nephropathy. In addition, we are collaborating with other VCKD members in analyzing how glucose modified extracellular matrix impact glomerular cell function. 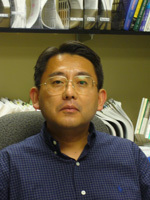 ​The Takahashi lab investigates the role of endothelial dysfunction in the development and progression of diabetic nephropathy. The lab has intensively studied the role of endothelial nitric oxide synthase dysfunction in DN. In collaboration with the Harris lab, they have developed targeted eNOS deficient mice that will serve as unique tools to probe this pathway in progression of disease. ​The Vanacore lab uses state of the art proteomic methodologies to investigate abnormalities in collagen IV synthesis and post-translational modification in diabetic nephropathy, with an aim to understanding the underlying mechanisms of progressive glomerulopathy in diabetic nephropathy. ​The Zhang lab collaborates with the Harris lab to study underlying mechanisms of diabetic nephropathy and to test novel therapeutic interventions. The lab has recently found an important role for the intrarenal dopaminergic system to retard progression of DN. In addition, the lab is investigating the role of the epidermal growth factor system in mediation of progression of DN.